I received an interesting email today from self-confessed "rugby nobody" Peter Dawson. 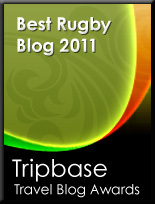 Part-grovelling, part-insulting but all-entertaining, Peter's email was basically a request for me to mention his new website - Rugby-sidestep-central.com which, as you can see, I'm more than happy to do. Peter, it seems, is somewhat evangelical about the sidestep and his website is a celebration of the art of the step as well as an instructional guide. Driven by the inspiration of watching former Welsh international and League legend David Watkins, the art of Cossack dancing and the need to push an old Ford Anglia up a hill (I kid you not), Peter taught himself to master the sidestep and maintains that anyone can do the same. So, if this takes off, then before you know it we'll have hoards of twinkle-toed props stepping their way through the opposition massed ranks instead of perhaps taking the more prosaic traditional routes. Peter has also made a promo video, in which he demonstrates his art like a geriatric Shane Williams on acid - sadly I can't embed the video in this blog but it's very entertaining and can be found here. 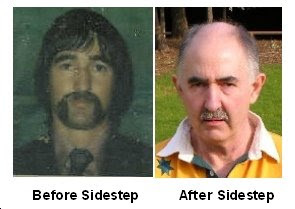 I should warn you, however, that the sidestep comes with it's own health warning - just look at the change that it caused in Peter's appearance for a start! From a personal perspective, I have a rather sparingly used step off my left foot in my armoury which gets dusted off for touch rugby but rarely makes an appearance in a full match - largely because it's difficult to step while buried in a ruck. It just leaves me to say good luck with the website Peter and with your sidestep crusade :). Slow, grey-headed Props like me chipping and chasing?! Great web site. I just added this to my favorites.